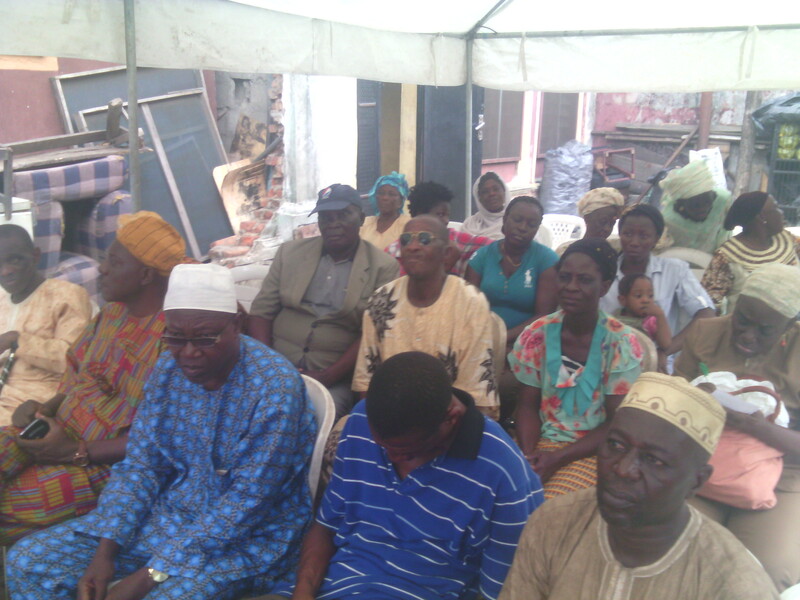 22 landlords benefited from SPACES FOR CHANGE’s | S4C’s one-day sensitization workshop on “Landlord and Tenant Relationships” at Ebute-Metta, Lagos Mainland area of Lagos State held on March 18, 2016. According to 2006 census figures, Mainland Local Government in Lagos State has a population of 317,720 people and Ebutte Metta is one of the most densely-populated Mainland communities. With many overcrowded housing facilities dotting the very dense informal settlements in Ebutte Metta, landlord-tenant infractions are routine, and form the bulk of the legal assistance requests Spaces for Change receives on a regular basis. The one-day workshop was organized in collaboration with Rural and Urban Development Initiative (RUDI). In attendance at the workshop included the Baale Idiro of Ebutte Metta and notable community chiefs such as Hon. Chief M.A.K. Lawal, the Baale Ago-Ijebu, Ijero Ebute-Metta (West) of Lagos Mainland LGA; N.K. Muritala of Ijero Community Development Agency (CDA); Mr. Rasheed Liameed, Chairman Ifesowapo CDA; Alhaji N.K. Muritala of Ijero CDA; Mr. K.B. Coker, Chairman, Odaliki CDA; Chief Mrs. Modinat Saka, Comrade Adeshina, Commander of Community Surveillance Patrol of Nigeria for Mainland, Yaba, and Lagos Island as well as other individuals from the community and neighbouring Ijora Badia-East LGA. Form – parties need to decide the form the tenancy agreement could take. It could be oral, but it is legally safer and preferable to be in writing; payment of rent (how much? when should rent be paid? ); identify term or tenure of tenancy (number of months, years, weeks, etc). Tenants were advised to ascertain that the landlord actually owns the property and can legally transfer possession and control of the premises to them. Tenants have rights to privacy; access to property as agreed; use of own property alone; and to insist that Landlord pays taxes imposed by law, and insures the property. Landlord has rights to receive the rent fixed when due; to be informed when repairs are to be made; to inspect the premises after a written notice has been given to that effect notifying the Tenant about the proposed inspection; to insist that the Tenant maintains the premises in a tenantable (fit for human living) state throughout the tenancy; and to insist that the Tenant pays all existing and future rates and charges not payable by the Landlord by law. During the interactive session that followed, participants sought answers to several questions, particularly regarding the use of generators at late hours by residents (this issue was concerning to many landlords considering the negative impact on security within the community); the landlord’s refusal to repair damaged ceilings and roofs; the landlord’s right to mandate and enforce contributions from residents for securing local communities. In response to these concerns, S4C legal representatives exhaustively discussed the Tenancy Law of 2011, with special focus on the provisions imposing a duty on the landlord to effect major repairs on the premises. Participants received free news bulletins and leaflets highlighting the concerning issues and the operative laws in force that govern them. An appeal from Hon. Chief M.A.K. Lawal, the Baale Ago-Ijebu Ijero Ebute-Metta (West), requested S4C to escalate the public advocacy on the security challenges faced in the community to state authorities. Mushin, Ebute-Metta, Fadeyi, and Ijora-Badia in Lagos Mainland have gained notoriety for this sort of disturbances. The Baale informed that within the last two months, the community had suffered series of armed robbery attacks on residential apartments, and two hotels, which led to the unfortunate loss of lives and properties. The insecurity is due in part to the practically non-existent police presence within the community which is ironical given that its high density. The state authorities are aware that the designated ‘Odaliki’ police post within Mainland Local Government, Ebute-Metta West has been in a dilapidated state for a long time. The community has made representations to the present officials of the Lagos State Government, but yet, executive action is still being awaited. After months of fundraising, Spaces for Change has not been able to locate the resources needed to launch its IFESOWAPO project designed to create space for systemic inquiry and to amplify local knowledge to inform and inspire action aimed at addressing the land struggles of the urban poor, youth violence and recurrent human rights violations in informal communities in Lagos. This project aims to respond to the issues of recurrent violence in urban slums using participatory media and research action project designed to empower community members with new skills in local research, media production, storytelling, leadership development, and human rights, through building on their creativity and knowledge of their own communities.